Sibabrata Das holds a B.Tech degree in Civil Engineering from one of the top technical institute of India, IIT Bombay. 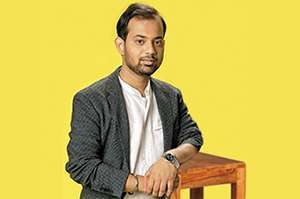 Even as a student he showed great aptitude for an entrepreneur in the making and had a number of laurels to his credit, including an E-commerce company which he co-founded with his batch mates during his final year at IIT Bombay. After successfully running this business for 2 years as a CEO, he exited the business to co-found Atomberg Technologies in collaboration with Manoj, another batch mate from IIT. Presently he oversees finance and overall strategy at Atomberg Technologies and is also responsible for scaling up the brand. Recently he was awarded at the National Entrepreneurship Awards 2017 at New Delhi from the Hon’ble Finance Minister Mr. Arun Jaitley, which followed by being recognized among the young achievers by the prestigious FORBES magazine.